Stems rather stout, stiff, smooth and often purplish with a whitish or glaucous bloom, usually branched, 2 to 5 feet high from a perennial root. Leaves usually petioled, ovate or ovate-lanceolate in outline, the lower one to two-pinnatifid, 4 to 6 inches long, the upper ones pinnatifid or deeply incised, the lobes lanceolate or oblong, pointed, entire or toothed, often nearly at right angles to the mid vein. Fruiting stalks longer than the calyx; calyx lobes five, ovate or ovate-lanceolate, pointed, entire, about equaling the tube in length. Corolla yellow, 11/2 to 2 inches long, smooth outside, slightly irregular, funnelform, not widely spreading at the mouth, pubescent within, the margin five-lobed. Stamens four, in two pairs. Fruit an oblong, smooth, pointed capsule about twice as long as the calyx. In dry or moist woods and thickets, Maine to Minnesota, south to Florida and Illinois. Flowering from July to September. 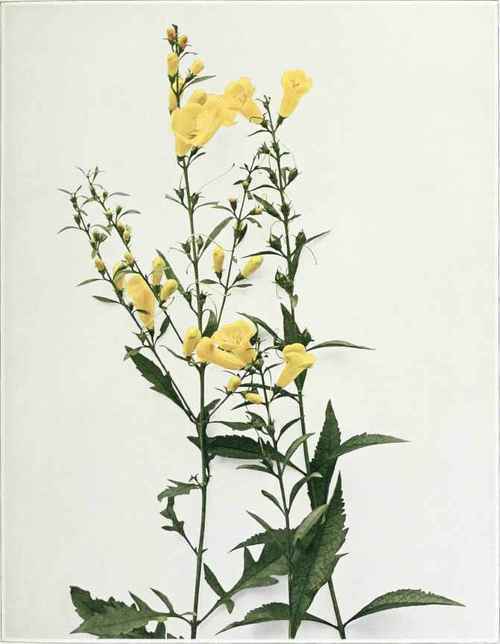 The Downy False Foxglove, Aureolaria virginica (Linnaeus) Pennell, [Aureolaria v i 11 o s a (Muhlenberg) Rafinesque; Dasy-stoma pubescens Benthem; D . f 1 a v a Wood; Rhinanthus virginicus and Gerardia flava Linnaeus] is grayish downy all over with fewer, stiff, erect stems; leaves entire or shallowly toothed or the lower ones somewhat pinnatifid; corolla smooth outside, much expanded at the end; the fruiting capsule pubescent. Common in dry woods and thickets, especially in the southern part of the State.